Tracks changing conditions in bays, coves, embayments, and coastal ponds: Water quality monitoring in coastal ponds and embayments would allow Rhode Island managers to track the health and status of these unique and valuable waters, but this program is not currently implemented. Supports development of water quality restoration plans: Many coastal ponds currently suffer from impacts of nutrient pollution. Fully understanding the extent and nature of that pollution is essential to addressing the problem and restoring the waterbody. Tracks effects of wastewater and stormwater management efforts currently underway: Monitoring ensures that management efforts are achieving the desired effects, prevents waste of economic resources on ineffective strategies, and identifies potential missed sources of pollution. 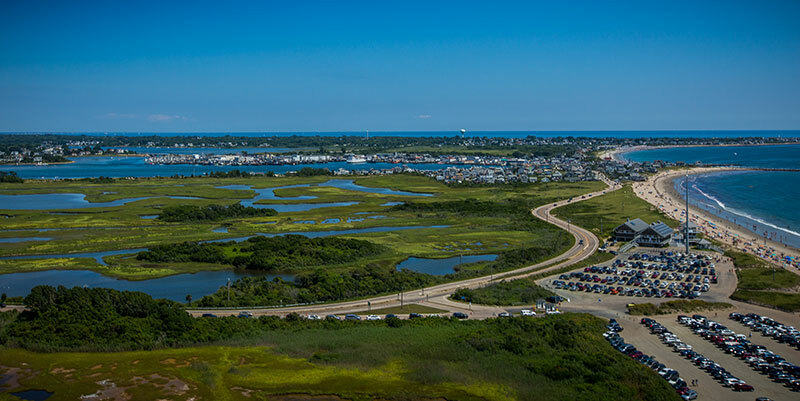 Some of the most unique areas in Rhode Island are the coastal lagoons, embayments, and estuaries that exist at the boundary between land and sea. The salt ponds along the south shore of Rhode Island are examples of coastal lagoons—shallow and separated from the ocean by a barrier beach; embayments are small inlets of the ocean or bay, such as Greenwich Bay; and estuaries form where rivers meet the sea, such as Little Narragansett Bay where the Pawcatuck River enters the Atlantic Ocean. These areas are often protected, shallow, and feature a mix of fresh and salt water, making them a unique habitat distinct from both freshwater and ocean environments. Salt ponds are a common feature of the south shore of Rhode Island. Map courtesy of RIGIS. Coastal ponds and embayments provide a rich array of eco-services. They are important habitat for commercial and recreational finfish and shellfish, as well as for migrating waterfowl. This biological diversity creates recreational and tourism opportunities for fishing and bird watching, as well as the enjoyment of basking in nature’s prime real estate. For example, Point Judith Pond is home to a commercial fishing port and the Block Island ferry terminal while Ninigret Pond is popular for recreational activities like wind surfing, boating, and fishing. The distinct characteristics of Rhode Island’s salt ponds—specifically the shallow water—also makes them excellent sites for oyster aquaculture farms. Kayakers on Ninigret Pond. Photo courtesy of U.S. Fish and Wildlife Service. Human activity has started to have increasing impacts on the salt ponds and other coastal ponds and embayments. For example, much of the development in the salt ponds region relies on individual septic systems rather than sewers that transport waste to a wastewater treatment facility. Even properly functioning septic systems release nutrients and bacteria to the groundwater and improperly maintained systems contribute even more at the cost of water quality. Studies have shown that a majority of the nitrogen—the nutrient of greatest concern in Rhode Island’s coastal waters—entering the salt ponds is from septic systems. Nutrient pollution can lead to algae blooms, low oxygen, and fish kills. Eelgrasses, which provide both food and physical habitat for finfish and shellfish in the salt ponds, are especially sensitive to elevated nitrogen levels, and nutrient pollution threatens many of the eco-services these waters provide. Low oxygen conditions can also kill oysters, while algae blooms and fish kills can impact the aesthetic and recreational value. Bacterial contamination of the salt ponds, which can also come from septic systems, leads to shellfish closures to prevent human illness. This is turn can have serious economic impacts on tourism—think restaurants, hotels, and beach revenues—as well as shellfish sales. Targeted water quality monitoring of these coastal water bodies is essential for managing their diverse resources and high productivity, and also ensuring public trust in the continuation of their many uses. Coastal ponds and embayments are popular areas cherished for their views and access to water-based recreational activities. It is critical to manage these uses to protect the environment and the economy that depend on them. Photo courtesy of Watershed Counts.